The Wall Street Journal may still be protecting much of its content with a pay-wall on the Web, but its new iPhone app is getting special treatment. Called simply WSJ—The Wall Street Journal, this official, pocketable WSJ portal offers unfettered access to a recent collection of the publication’s articles and media. As with any 1.0 product, however, Dow Jones & Company’s first foray onto the iPhone leaves some room for improvement; it also contains hints that the free ride may not last. Heard on the Street: WSJ, the mobile version of the Wall Street Journal lets you flip between articles, videos, and audio. This free app for iPhone and iPod touch users opens to a “What’s News” section with a list of the latest headlines. An ad sits above the navigation toolbar which offers quick access to sections like Markets, Editor’s Picks, and a More button for WSJ’s other areas of coverage. At the top of the headline feed area are buttons to switch between articles, videos, and, if available, audio. Tapping the WSJ Radio button in the What’s News section, for example, will gracefully fade out any audio playing from the iPod app and bring up the iPhone’s default media streaming player. WSJ offers equal doses of appreciated polish and unfinished features. For instance, the app will re-open to any article you may have been reading the last time you quit (though not the place you were at). It supports landscape mode, and a save button allows you to read articles offline. For those who want faster access to their favorite sections, the Edit button at the top of the More section works much like it does in Apple's iPod app. Tap it, and you can choose which buttons appear in the bottom toolbar simply by dragging and dropping new sections down there. On the other hand, WSJ displays headlines in a type size so large that you can probably read them from orbit, and they’re also accompanied by really large thumbnail images. Combined with the ad above the toolbar, this means that no more than three headlines will fit on screen at once in portrait mode, and not even two in landscape. Further, while you can save any article for offline reading, my brief testing indicated that you need to view that article at least once under the Saved section in order to download and save a copy; the app does not simply pull articles down in the background. Features and version 1.0 nitpicking aside, it is quite interesting that WSJ is not enforcing the Wall Street Journal’s usual pay-wall on this iPhone app. You don’t even need to register for a free account to gain full access to any article—at least for now. After some investigation, it appears that WSJ has taken (or may soon take) a few steps to limit the iPhone’s access to its content. First and foremost, WSJ only has access to a limited collection of content from each category. For example, the oldest article I could find was from the Quirky section and dated March 24. Also, there is no search; what you see under each of the app’s content sections is what you get, and you cannot browse for older articles. Perhaps more important, the Options area (available in the app, and not needlessly hidden away in the iPhone’s Settings app) hints that features or content may be added (or reserved) for paying subscribers in a future version. You can optionally login right now to “help us improve our iPhone product,” but the app also says that there may be “future exclusives” to take advantage of. That could mean anything from the pay-wall eventually coming to the iPhone to allowing users who register free accounts to comment on stories. All things considered, it's nice to see WSJ officially arrive for iPhone and iPod touch users, as the app is pretty full-featured for a 1.0. As long as some of these initial quirks are addressed in an update or two, and any eventual paywall restrictions are not too overbearing, this will be another great option for getting your news fix on the go. 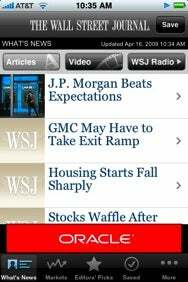 WSJ—Wall Street Journal is compatible with any iPhone or iPod touch running the iPhone 2.1 software update.